Daylight Saving Oils - Jasmin - Amphora Aromatics Ltd – Supplier of pure essential oils and aromatherapy Products. Daylight saving oils! Cheerful aromas to help combat winter blues. A week of uplifting oils to help you adjust to the darker evenings. and so we’re lacking the required amount of Vitamin D. This can have a detrimental effect on the everything from hormone production, digestion, sleeping patterns and energy levels. So, it’s hardly surprising that so many people feel down and miserable at this time of year. 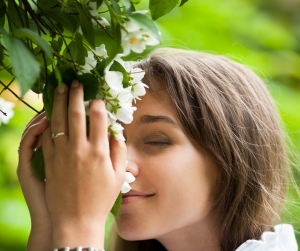 Aromatherapy can be very helpful in helping to lift that gloomy feeling. This week we’ll be looking at 5 essential oils which can help to create a positive mood and mind set. It’s really easy too! You just have to burn or vaporise the oil or place on a tissue and inhale. This is because our sense of smell is directly linked to the area of our brain which sends emotional directions to the rest of the body. We start with Jasmin. Also known as the “King of Oils”, Jasmin’s effect on our emotional wellbeing is thought to be warming, relaxing and yet stimulating. A valuable oil for helping treat depression and helping to restore self-confidence and self-love. 1 drop Jasmin diluted absolute- uplifting, relaxing and rejuvenating. 3 drops Rose Otto diluted absolute – often used in massage to help alleviate stress, depression and nervous tension. 2 drops of Rosewood essential oil– emotionally balancing, useful for relaxation. Alternatively, you can create a gorgeous linen or room spray by adding 30-40 drops of this blend into a 100ml bottle with atomiser. Simply fill the remainder of the bottle with distilled water or one of our gorgeous floral waters - Rose or Geranium would work well for this blend. Give it a good shake and its ready to use!